penetrating the liner and causing a leak. Make indentations in the bottom of the garden pond hole where plants will be planted. Put down the underlay and pond liner. Place the plant pots in the preformed indentations and line the pond with a layer of washed river sand (sharp sand). Finally place the pebbles on top of the sand. Although your plants are still in pots, it will appear as if they are growing through the pebbles. Make a ledge around the garden pond approximately 3 inches (75 mm) below the final water level. Build your rock edging on this ledge and backfill with soil. It will appear as if the rocks form a natural barrier keeping the water in the pond. How to build a pond for wildlife: A sandy beach which gradually slopes into the water provides an excellent area for wildlife to get safe access to the water. Also make sure that there is a clear view for the birds from this beach. They will not feel threatened and will stay longer and possibly have a bath as well! How to build a pond that lasts: A durable garden pond is created by plastering the liner with a 25 to 35 mm layer of mortar. Mix 1 part cement with 2 parts river sand and one part building sand add a waterproofing agent. Use only enough water to make the mixture workable. Line the pond in one go. If you stop and start again you will have a crack in the pond. Line the pond with mortar. Place a layer of plastic cling wrap on top of the mortar. Firmly push each rock into its position on top of the cling wrap. The mortar will take the shape of the rocks. Remove the rocks and cling wrap after the mortar has dried. Temporally store the rocks so that you will be able to position them back in exactly the same position later. Apply silicone sealer to the mortar and “glue” the rocks into their correct positions. The seal will not be visible. Ensure that you use a non-toxic sealant or else your fish will surely die. When dry, the joint will be permanently sealed! Please wait until the silicone has completely dried before filling the pond with water. This procedure requires patience, but is well worth the effort. Doing it right at the start will save you time and expenses later – Guaranteed!! Use the correct size pump if you are going to filter the water and or have a fountain. Take the loss of head in the filter into account when choosing your pump. Also choose a pump one size larger than you think you will need. It is easy to throttle the flow back a bit if it is too much, but you cannot increase the flow if it is to slow!! Do not reduce the size of the pipes. Use the same diameter pipes as the pump inlet and outlet. Rather increase these diameters to reduce the friction in the pipes. High friction will reduce your water flow. Protect your pump by placing a nylon stocking (ladies pantyhose) over the pump suction. This will prevent dirt entering the pump and prolong your pump life. Replace the stocking often. Hide your pump behind something in the pond. Pumps are unsightly and detract from the natural look and feel of a garden pond. Similarly hide the source of your water outlet. Let the water bubble out from beneath a few rocks or pebbles, or use large leaves to conceal the end of the pipe. 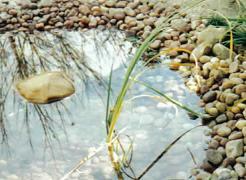 Choose different sizes of pebbles to line your pond. In nature pebble sizes differ. Three different sizes will suffice. Try and copy nature by putting a few larger rocks here and there. Having a rock protruding out of the water will also provide an ideal landing place for birds. Just don’t over do it. Nature is the best teacher on how to build a pond. Keep your pond healthy by replacing some of the water every week. An excellent idea is to build a bog area at the pond overflow. When you put fresh water into the pond, the overflow will keep the bog wet. A bog area is made by digging a hole and lining it with pond liner. Push a few holes in the bottom of the lining with a garden fork. Fill the hole with special bog garden soil. Now that you have a basic idea on how to build a pond, why don’t you give your garden a face lift with a garden pond design ? Oh I almost forgot. Before you start digging the hole, get some garden landscaping ideas and look at your overall garden design .